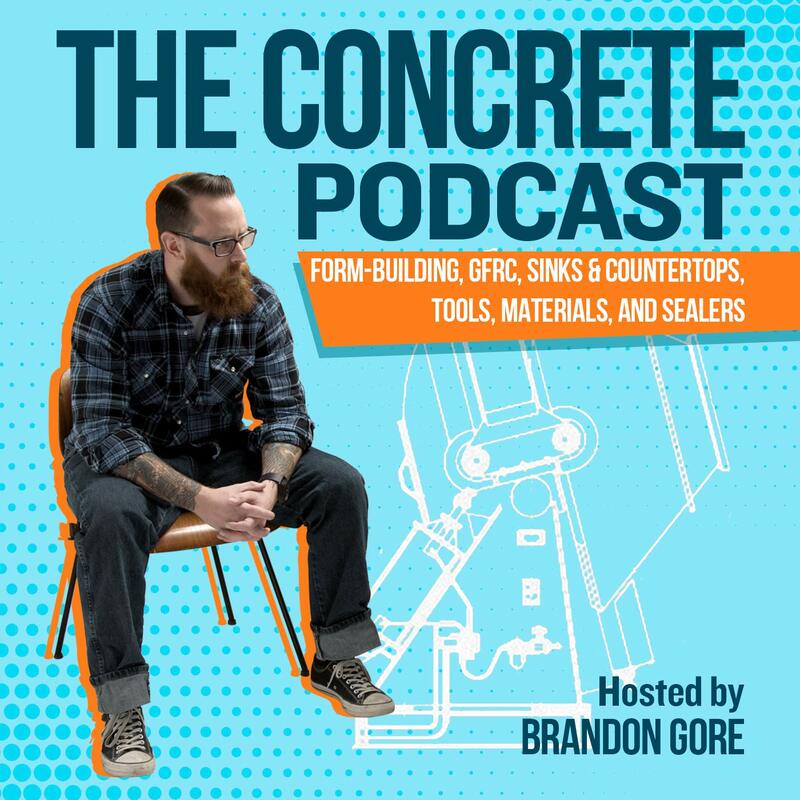 INTRO WITH MUSIC: Welcome to The Concrete Podcast, where we talk all things concrete. Featuring your host Brandon Gore. Brandon Gore: Are you ready to do this? Michael Karmody: I think so, I mean you're a little muffled in my ear, and it may be my phone, or maybe something about the audio. Brandon Gore: let me see, let me turn up the audio real quick, test, test, test, test, test, it shows that the audio is pretty good; on this. Michael Karmody: Well we'll see how it goes. Brandon Gore: Cool; do you have the volume on your phone turned all the way up? Brandon Gore: Do you have the volume on your phone turned up, the little thing on the side? Michael Karmody: Yeah, yeah, I do, and maybe that's the problem, it was just up too far. Brandon Gore: I don't think it can be too far. Michael Karmody: Yeah, yeah, you can turn up to 11, and that's too far. I mean, you're not supposed to say that out loud but it's true. Brandon Gore: So my guest today is Michael Karmody out of Holyoke Massachusetts, is that correct Karmody? Michael Karmody: Yeah that's correct. Brandon Gore: And, tell us, first of all let’s get started with; what do you do and how long you've been doing it? Michael Karmody: Well, I work in concrete and I've been working in concrete for quite a while I guess, and I was working since the late nineties, and I've gone from precast traditional materials into GFRC, currently, almost everything I do is on-site, almost everything I do is cast in place. That doesn't mean that I don't still use my shop to make some elements that I bring on site, most of the work is done right where it's going to go. Brandon Gore: Awesome! Well that's the focus of this podcast today, cast in place versus precast, and why you choose one over the other. Now I personally have done very, very limited cast in place, it scares me to death. If something goes wrong on a job site it could be catastrophic. But you seem to prefer cast in place, why is that? Michael Karmody: I like the drama of what happens on site; things can go wrong, and that makes you pay extra attention to making things go right. But the other thing you've got about cast in place is you've got to be part of that construction project, you are not some anonymous person who is doing some sort of weird magic often, off someplace else, you're doing it right in front of them, so, very often an onsite crew seeing that will help you out, and help you make it better than you could have made it yourself. Brandon Gore: So you like being under a microscope with the customer? Michael Karmody: Absolutely, if it gives them far more trust in what I'm doing, I mean, everything that we do in concrete is under the microscope anyway, the smallest little thing that you forget can lead to the biggest failure, and that's true both in the shop as it is on site. Brandon Gore: I hate when customers watch; which I don't do deliveries often, but if I'm doing a delivery and the customer is standing over my shoulder, it stresses me out so much, I prefer to be the wizard behind the curtain and they never get to see me. I ship it to the job site, that's it. Michael Karmody: I get that, I mean the customer doesn't want to; you don't want to ever show any flaws, but of course that there are any flaws the customer is going to see them in an outsized sort of way, I have to admit, that mistakes have been made while casting on site, but 9 times out of 10 I'm using my customers as my employee as well, which makes it theirs, it makes it part of their story and, they really own it. I mean, it really becomes something that they love, to say they've have their hands in it. And they've never been offered that opportunity in almost anything else they've done. But I don't necessarily need them to help in order to get that impression, they've seen the work that is involved in order to get what I make for them. They understand that it's not an easy thing to do, it becomes something invariably they're really proud of having. Brandon Gore: That's an interesting way to look at it. Why did you make the switch from doing precast to cast in place? Michael Karmody: It happened kind of accidentally, I was scheduled to make this bar for a new restaurant and it was going to be 22 and 1/2 feet long, and that's something that I've made pieces that large but I've moved into a new studio; and if it had been 20 feet long I could have made it in the shop and got it onto the back of a tow truck and delivered it that way. But it was 22 1/2 feet long, there was no way I could easily get it out of my shop and on to a truck, and onto the site. So I decided to break the form into 2 and bring it onsite and cast it in place. And it was in a form, on wheels, but it was essentially going where it was going to go. Just after casting I had to take it out of the form, drop it to the ground and move it about 13 inches over to the wall. So, for all intents and purposes it WAS cast in place with the addition that I had to get it out of this form and get it to the ground. Michael Karmody: Instead of doing the mix myself I was able to work with a ready mix truck. And there was something through the experience of having a ready mix truck in a finished space with everybody involved, owners and other trades there for this thing. It was kind of a carnival like atmosphere that everybody got a good story out of it. Brandon Gore: That's awesome. So today when you do a piece for a customer, what is the deciding factor on which method you choose, precast are cast in place? Michael Karmody: It really depends on the circumstances; recently I did a bathtub, it was on an Island so a ferry was involved, the bathtub would have been about 3000 pounds if I had cast it in place, and getting 3000 pounds of anything onto an Island is going to be hard. And there was the other aspect as the bathtub although large, took about 120 gallons of water is around about 1200 pounds. 1200 pounds of water would be over massed by 3000 concrete, so it would be very hard without radiant coils to make that water warm. So I decide to make the tub element in the shop and then cast around it to cast the plates around, essentially, and meet the two. It turned out seamlessly, it looks like it was cast in place, but I was able to get the quality control that you could get in the shop, in the tub. I was also able to make the tub a lot lighter than it would have been had I had to work with the cast in place techniques on site. Brandon Gore: Got you. So you do a hybrid sometimes, so you do both on one piece? Michael Karmody: Very definitely, I'm looking at each project for what it needs, and very often the traditional concrete is going to be just fine for cast in place piece, but sometimes another material is the way you want to go, there are many options as many people know in concrete, when you got to cast fiber reinforced concrete you can use rapid set cement, or you be very traditional with steel reinforcement. It depends on what you need to do, and what can the floor take, what sort of time do you have to work on site, what was the atmosphere on site? If the atmosphere looks toxic on site, and I've been stupid enough to take the job, then I want to get out of there as quickly as possible. If the site offers me some more time to work then I can work with traditional concrete and I can play with that kind of weight and; but it depends. Michael Karmody: So I look at, the fact that I do cast in place initially as another arrow in my quiver, because I come from a long term cast in the shop background. But I really enjoy the experience and what has allowed me to make my shop, is a place where I can do a lot of experimentation. I work with a lot of different materials and find out how they work together, and that really enhances what I can do on site. And the fact that the people are there and they get to see what I do and hopefully not screw up, gives them some appreciation for what this material is. So I enjoy it, they enjoy it. I also get to make much, much, much larger pieces than I could in the shop; a job I had last year, there were not one but two pieces, they were well over 30 feet long with waterfalls either end, that's a hard thing to move. Michael Karmody: So I get to make some things that are bordering on huge, and I get to deploy them with a certain elegance. There are some downsides if you're looking for an absolutely factual piece, there are always going to be some sort of things that indicate how it was made, and that is going to be part of the story. And so, your client needs to accept that the human hand is going to be involved; especially because the ultimate surface is, we're dealing in counters. Is going to be a completely hand worked surface. So they better be okay with the gesture of the human hand. Brandon Gore: Absolutely. You’ve always been known for scale, when I teach classes I talk about becoming known for something, whether it be sinks, or countertops, or planters. And I tell the classes there's a guy named Michael Karmody who's known for scale, pieces that are so insane that nobody else will touch, he's the go-to guy to make these huge pieces either precast or cast in place, but to bring those to reality. You've never been afraid of scale it's always been your thing. Michael Karmody: It has been, it has been, I used to really enjoy the theater and I still do enjoy theater moving something that's very big. You have to build an infrastructure to go along with it, the crating techniques have to both serve each particular leg of how you're going to deploy on site. And then the crating system has to fall apart in an elegant way, and at no time can anybody have any lack of confidence in what you're doing. It's a show, that show demonstrates the confidence of your clients that you are also with the elegance of your deployment you're deploying something that they're going to love too. Brandon Gore: I love you! I love the way you phrase things, it just sounds so good. So since this is really; because what you're what you're specializing in more and more these days is cast in place, what has been your biggest failure to date with a cast in place piece? Michael Karmody: There are the projects - I just described about the bathtub. I actually had a blow out; that almost never happens, so I made a stupid mistake, and I was working with rapid set concrete, so it was in the front of the midst of everybody watching what I was doing; the form blew out. Not a great circumstance. However I was able to recover by taking the form apart and removing the first piece, and then setting up a day later to do the final casting. It was a lesson, I thought that I could cut a corner in that case and it nearly bit me hard. Michael Karmody: But in the end it turned out just fine. Brandon Gore: Awesome. My next question is what has been the best lesson you've learned when it comes to cast in place? Michael Karmody: It's the same lesson that everybody in this business probably knows true, is true, it's like if you have to ask the question then the answer is you have to do it. Michael Karmody: And a good friend of mine told me that hydraulic pressure is something not to be trifled with. Brandon Gore: That's correct, never underestimate hydraulic pressure, and I always underestimate hydraulic pressure to this day. Michael Karmody: Like if I'm doing a waterfall on site, or in the shop or anything, the amount of structure around the form to make sure that things don't move much, because they are going to move, are really important, those whalers better be big. And it's a really good idea if you can arrange it to get truck like ratchet straps around everything, and you tighten them so they make a certain tones, you know what that tone is. So as you're doing you're passing you your pluck the strap to see if the tones gone up, if the tones gone up then the form is pushing out. But at least you'll have a system to tighten it down, and always have 3 or 4 times as many clamps as you think you might possibly need in the worst circumstances. Brandon Gore: Absolutely. That's good advice. Well that brings me to my last question, that is, if you could give advice to somebody just now getting into this industry, what would that advice be? Michael Karmody: Get a real job. Brandon Gore: And what would that be? Work at Starbucks? Michael Karmody: It's a really good question, because some of the best people in the world are drawn to concrete, and everybody admits that they're a bit foolish to have gotten into it, because it's a really difficult material, concretes one of these things that tests your will; The minute you think you know anything about it is going to teach you, and rather, and subtly how much you don't know it. You have to be absolutely committed to it, it's a beautiful material, but you can't have the kind of normal assumptions people have with business, there's no proprietary secrets, the secret is hard work. You have to be in love to use this material, and if you're not, it's going to show. Brandon Gore: Awesome, good advice. Michael Karmody: So, if you think that you have enough love to go through all the heartache that this is going to give you. If you think that you can continue to make decisions based on factors you have no idea about now, you stay dynamic. You can stay, you can find that love then this may be the material for you. If you're looking for a steady gig, you're a fool. Brandon Gore: Yeah, that’s sage advice, I agree, you got to want to do this, I see guys that maybe do flatwork or other things, and they think, I'll transition into doing decorative concrete, whether it's sinks, or countertops, and it's a whole ‘nother ballgame you have to really want to do it, to do it. Michael Karmody: It really is, when you're dealing; people understand flat work because a lot of flat work and other kinds of concrete elements, because the full senses aren’t necessarily appreciating them, it's like you know you walk along the sidewalk, park your car and driveway, you require a foundation to build a house, you might even build a wall, but like nobody is putting their nose against it and rubbing their hands all over it. Once you come to the idea of sinks and counters, hearths, and fireplace surrounds. Architectural elements that are handled directly by the human senses, not just by detective elements but something is part of their environment. You have to be able to provide solutions that each client specifically is going to need, so you're going to have to be able to be fluid enough, and astute enough to pry out what it is that they want and what they need. You can't just give them a boilerplate solution, it's just not going to work. Brandon Gore: Sure. I think the other thing too is, flat work, or foundations, or anything of that nature it's all been figured out, it's way older than what we do in a sense, and so the science of it, the forms, the form ties, the whalers, the whole system has been thought out you just follow numbers. With what we do so much of the time, is, we're doing it for the first time ever, nobody's done this the way we're doing it, and so it's an experiment a lot of the time, we're hoping it's going to work out. Michael Karmody: Well, let's hope it’s an experiment all the time, because that brings improvements, and what you just said falls back on what you were just saying about the established trade techniques, and that's all they are, established trade techniques. There's no reason that those techniques can't be updated; concrete is a material that anybody; ask anybody who works with it, nobody understands; and if they say anything else they're lying or they just got into it and they think they know everything. Michael Karmody: The kind of work that you and I do, we are, we're pushing the boundaries of what is possible, we're also introducing the possibility of new techniques that could be used in large in the building industry. Brandon Gore: Absolutely, absolutely, and sometimes I've personally developed techniques to cast the piece that I found out later have been around for 50 years, used for other concrete applications, I just didn't know about them. So that also happens as well. Awesome, well, do you have on the other parting advice, Karmody? Michael Karmody: No, I don't know. Avoid February in New England. Brandon Gore: That's good advice. Michael Karmody: No, I think we've covered a small section of what concrete is; concrete is one of the most exciting materials there is. And anybody working in it should never forget that, that they have a client that wants it. It's a gift. Brandon Gore: Absolutely all right sir, well that will conclude this episode and I'm sure we'll speak again soon on something else, on another concrete topic. Michael Karmody: I look forward to it Brandon. Thanks, thanks for calling me up. Brandon Gore: I appreciate it buddy, thank you.